Home / MLJ Adoptions / Meet Samantha! Hello all! 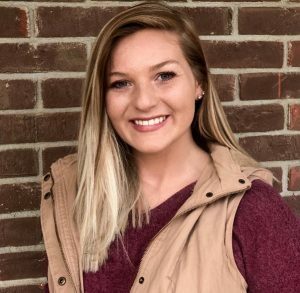 My name is Samantha Brown, and I started working with MLJ Adoptions International in May 2018 as an intern assisting with several International Programs. Through the course of my internship, I found assisting prospective adoptive families greatly rewarding and a way to impact the lives of families and children. I have recently completed my Bachelor degree in Psychology from the Indiana University/ Purdue University Indianapolis (IUPUI) and now in my full time position, working as the International Program Assistant in the countries of Burkina Faso, Haiti, Individualized Country Programs, Mexico, Nicaragua, Peru, and Samoa. Previously, I obtained my Associate Degree in Human Services. I am now currently preparing to obtain my M.S.W. from IUPUI with a concentration in Mental Health. In my free time, I enjoy working out, writing, spending time outdoors, and surrounding myself with family. I feel incredibly blessed having received this opportunity to serve vulnerable child and adoptive families through my position at MLJ Adoptions. In my position, I assist adoptive families navigate their adoption processes. Working in the field of international adoption is tremendously rewarding and humbling. I have become increasingly passionate about working with diverse cultures and children in need of forever families, and I hope to continue working with these populations throughout my career. This job has brought me joy, given me purpose, and allowed me to help the most vulnerable, children in need of families worldwide. Most importantly, it will allow me to assist children and adoptive parents to see light within their darkness and further grasp onto hope through adoption. When I can bring a family and children to hope, then I know I have served my purpose. I look forward to serving prospective adoptive parents and vulnerable children in need in my position with MLJ Adoptions International!